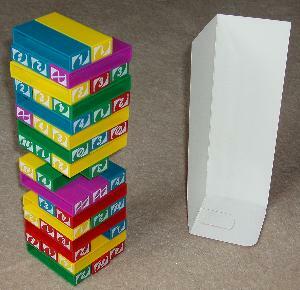 45 plastic blocks in various colours, each with a number or symbol on its ends. Loading tray made of flimsy cardboard. The blocks are stacked in rows of three to form a tower with the help of the loading tray. The first player removes a block from the tower and places it on the top, using only one hand. The next player must then remove and stack a block of the same colour or number. And so on with the next player. Reverse - reverses direction of play. Skip - skips the next player. Take two - the next player has to take two non-special blocks of the same colour as the 'take two' block. Joker - the current player chooses the colour which the next player must take. 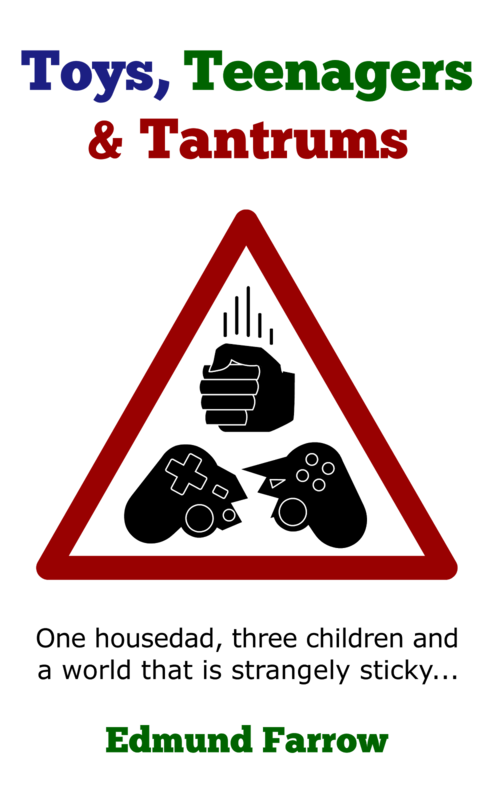 In a two-player game, reverse and skip blocks are treated like 'take two' blocks. Object: To not be the one who makes the tower fall over. Game length: Takes a couple of minutes to set up each time and then lasts somewhere between thirty seconds and five minutes. Number of players: 2-10 allegedly but it only really works with three or four players. More than that and not everyone will get a go; a two-player game, meanwhile, is heavily weighted in favour of the person going first. Age: 7+. Anyone younger is really going to struggle. Even children older than seven will probably need to cheat and use two hands. Comments: You can kind of see what they were thinking when they created this. (Jenga and Uno are both great games, after all.) Unfortunately, Uno Stacko just doesn't work. There simply aren't enough blocks of each number and colour and it's easy for someone to be stuck in a hopeless position after very few turns at all. Worse, the plastic blocks can stick to each other a little, making them difficult to slide out of position. (They also clatter horribly.) To add to the frustration, the loading tray is nowhere near sturdy enough, increasing the set up time between games. To be fair, the game isn't a complete disaster. The genetic material fused together to create it is very strong, so Uno Stacko has its moments. It's really not worth the effort, though. Play Jenga or play Uno; don't play this. Conclusion: Coming to a charity shop near you soon. Some of the matching fun of Uno. Some of the tower collapsing fun of Jenga. Can be used as a small set of building blocks. Can be over in seconds. Easily disrupted by a passing toddler. Takes up space in a cupboard that could be filled by something better. You know, like Jenga.